Today was a special day for our monastery and our Capital Campaign,"A Future Full of Hope". 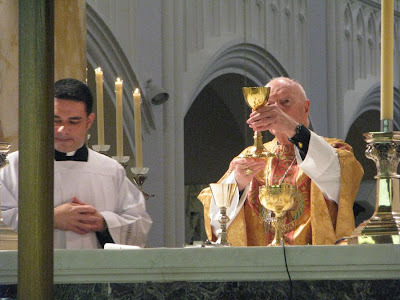 His Eminence, Theodore Cardinal McCarrick graced us with his presence and offered the Holy Sacrifice of the Mass for the intentions of all our benefactors, particularly those who have donated to our capital campaign for our kitchen and refectory renovation project. Our chapel was nearly full with many friends and family members. Seminarians James De Fillipps, Zachary Swantek, Alfie Pangilinan and John Carlos De Sousa served on the altar. Mr. De Sousa served as Master of Ceremonies. We were delighted to have them and look forward to the day when they will offer a Mass of Thanksgiving for us! Cardinal McCarrick shared with our guests the progress made on the capital campaign and the need to raise approximately $62,000 before we reach our needed goal of $500,000. He shared how, when he was our archbishop he would frequently come to the monastery to visit us and how he would count on the prayers of the nuns. Indeed, we have memories of urgent prayer requests posted on the bulletin board and of the Cardinal surprising us by stopping by unannounced! After Holy Mass (the Sisters sang beautifully, at least that is what our guests told us!) everyone went downstairs to St. Dominic's Hall to enjoy a wonderful breakfast provided by our generous benefactors of the Grand Summit Hotel. You can see a slideshow of the event on our Capital Campagin Website. Recordare! One Year Ago This Sunday!